"I just don't have the time" is perhaps the most common excuse for not exercising regularly, especially among the 25-and-older crowd, who are generally immersed in such time- (and energy-) sapping pursuits such as a career, raising children, etc. 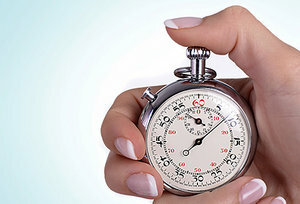 While it's true that committing to exercise requires just that – a time commitment – no one said how much time. Mud sprinting: Run as fast as you can for 45 seconds – without ending up any farther than where you began. Bend your knees and elbows, and lean forward slightly (keeping your eyes straight ahead and back in neutral) and sprint in place, lifting your feet off the floor with each step and moving your arms forward and back in tune with the motion. Push and go: Perform standard push-ups for 45 seconds, but with a twist: After each push-up, when you've returned to the starting (elevated) position, move one hand from the starting position to your left or right, and then do the same with your other hand (essentially, reposition your hands – as you follow with the rest of your body – so you're moving across the floor from one push-up to the next). You'll be surprised at the extra work your arms and chest need to do, and it's a nice change from the single-position, one-after-the-next push-up most of us are used to doing. 180 degrees: Using a sturdy chair or other elevated, flat surface that can support your weight, do five inclined push-ups (hands on chair, legs extended on floor behind you) ... then get up quickly and turn around 180 degrees, repositioning your hands behind you on the chair (facing away from the chair this time), so you can do five triceps dips (bend arms to 90 degrees behind you as you lower yourself toward the chair, keeping your elbows in a fixed position so you engage the back of your arms). Then switch quickly back to push-up position and repeat the routine for 45 seconds. Crunch, then catch: Assume a standard crunch position (lying on the floor, knees bent, etc. ), but take a small medicine ball with you (the kind you can easily throw into the air and catch). Figured out what you're going to do yet? It's simple in theory; challenging in execution. As you crunch up 30 degrees or so, toss the ball in the air at chest level with both hands and catch it – while holding the crunch – and then return to the floor and repeat. Feel the burn for 45 seconds. Back and forth: Secure an exercise band around your feet, a table leg, etc. Sit on the floor, feet out in front of you, knees slightly bent, leaning back slightly (without putting the low back at risk). Grasp the handles of the band at shoulder width and pull toward your sides, spreading your chest as you do so; then extend arms back to starting position and repeat for 45 seconds. Focus on working the muscles of the upper/mid back, not your arms. So, no more excuses for not exercising; this 5-minute workout will leave you energized – and with plenty of time left to enjoy your (busy) day. Remember to talk to your doctor before starting any exercise program if you have a pre-existing health condition and/or need more information on the proper performance of these and other exercises. 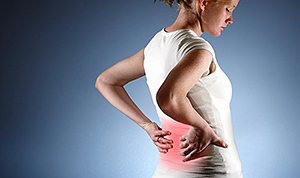 Sciatica is a condition in which pain radiates from the lower back down one or both legs. This is generally caused by a problem in your lower back. While many people believe that sciatica requires surgery, a new study found that "sixty percent of patients with sciatica who had failed other medical management benefited from spinal manipulation to the same degree as if they underwent surgical intervention." Chiropractic can alleviate many of the symptoms related to sciatica and can do a lot for those who are suffering. Given the potential dangers related to surgery, chiropractic spinal manipulation should be the first choice for those suffering from sciatica or any form of back pain. The purpose of the study, published in PubMed was to compare the clinical efficacy of spinal manipulation against microdiskectomy in patients with sciatica secondary to lumbar disk herniation (LDH). If you suffer from sciatica, make sure to talk to your chiropractor about your options for relief and healing. Children are malleable beings and sometimes that means we have a handful on our hands…but sometimes, that works in our favor. In the case of trying to help your kids adopt healthy lifestyle habits, this malleability can work in our favor. Many of my patients in my integrative medicine clinic in San Jose CA will give up on trying to get their kids to eat vegetables after their kids refuse veggies once or twice. In my experience, if they are given a variety of options and frequently in different preparation styles, more often than not, my patients have seen that their kids will then start to accept the vegetables. They may not necessarily love vegetables, but they start to accept the fact that they need to eat them. So, I would recommend to keep trying and to keep trying different vegetables and in various different dishes. 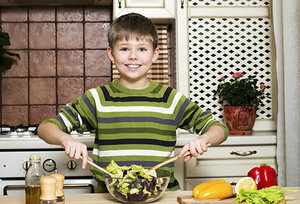 However, if you feel like you've tried everything you can and repetitively but find that your children still refuse vegetables in its natural format, you may want to try to puree them into your sauces like spaghetti sauce or sauces you put over meats so that they at least get the nutrients of the vegetables without having to actually taste the texture. If your children already like eating vegetables, then you need to make sure that you encourage movement and exercise as a daily habit as well as making sleep a sacred priority for your kids. As a family, encouraging at least weekend outdoor or indoor activities that keep their bodies moving is a good thing. If they grow up feeling like being active is a natural thing, they are more likely to do it as adults. So, going for hikes or bike riding on the weekends or going indoor skating or working out with your kids are good ways for your kids to see how much fun exercise can be. What people say about seeing is believing is actually true for most healthy habits. So if you want your kids to make sleep a priority, you need to as well. Many of my patients will set a lights out time in the house for every one so that their children can see how important sleep is. If they are well rested, many issues like ADHD and mood fluctuations as well as even level of stress can be tempered since sleep helps with our body's ability to manage stress hormones as well as help balance and repair our neurotransmitters. Finally, avoiding processed foods and drinks are just as important as eating vegetables because what we eat heavily defines how our health will be. So even if you are eating a lot of vegetables, if the other things you are eating are refined and processed, your body is still more likely to be inflamed. Eating processed foods can put your kids at risk for any genetic predisposition they may have towards various diseases, so make sure you stock your house with healthy real food options instead of foods that come in packages or wrappers or tin cans. You have to be a good role model because kids will likely look towards you for what is normal behavior, so keep that in mind the next time you are at the grocery store and deliberating on what to buy. When it comes down to it, I can sum up the best way to help your kids adopt healthy lifestyle changes in just three words...Live It Yourself! You'll never go wrong if you are doing the right things, your body will benefit and your children's health will as well.